The vibrant red-colored, exquisite and delicate raspberry is a powerhouse of innumerable health benefits. The fruit which is a rich source of nutrients, minerals and vitamins, when included in your daily diet can help lower risk of cancer, obesity, cardiovascular diseases and even enhance fertility. The fruits of raspberry have nutritious, protective and curative value. They contain many antioxidants (anthocyanins, vitamin C, folic acid, provitamin A, vitamin B1, vitamin B2, etc.). Fruits are rich with minerals (potassium, phosphorous, manganese, copper, calcium, iron and magnesium) therefore they are recommended in the diet of children and for elderly. Also it contains water, sugars, organic acids, fat, nitrogen, colored and scented substances, enzymes and fiber. Raspberries are highly appreciated for its pleasant, aromatic, refreshing taste and aroma. The energy value of 100 g fresh raspberries is 52 kcal. Raspberries are rich with antioxidants. 25 % of the antioxidant activity of raspberries belongs to the anthocyanins. They provide intense red color of the fruit, protecting the body from the damaging effects of free radicals, possess antimicrobial properties and prevent the growth of bacteria and fungi in the body. The ellagic acid contained in this fruit has multi beneficial effects. Act in a way that makes complexes with toxic metals and discards them from the body, slows proliferation and in some concentration completely stops the division of cancer cells. Raspberries are an excellent source of vitamin C, a powerful antioxidant. 100 g raspberries contain 26.2 g vitamin C, which helps in fight against infections, inflammation and fight free radicals in the body. Great amount of fiber (6.5 g per 100 g raspberries) makes raspberry perfect for improving the performance of the intestines and preventing the development of colon and prostate cancer. Fibers are increasing sensitivity to insulin and thus prevent the development of type 2 diabetes. These fibers slow down the absorption of sugar and cholesterol in the blood and can be used as their regulators. 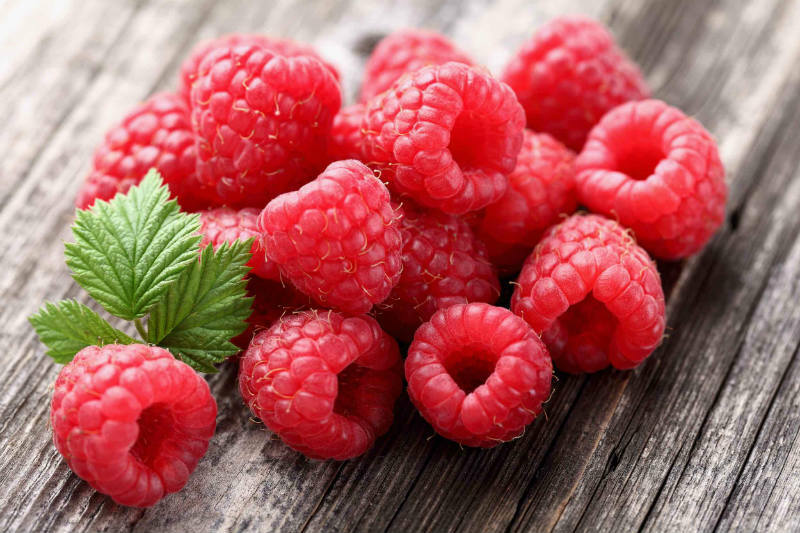 Raspberry is recommended as a dietary food for patients with diabetes, also it is used for people with kidney disease, and those suffering from rheumatism. Raspberries are healthy for the heart and blood vessels, because they bind bile salts in the colon and they discharged them from the body. Raspberries contain a large amount of minerals like potassium, copper, manganese, iron and magnesium. Potassium is an important component of cell and body fluids because it controls the heart function and blood pressure. Manganese is used as a co-factor for the antioxidant enzyme and copper is required for the creation of red blood cells. Raspberries are rich with vitamin B group (B6, niacin, riboflavin and folic acid) and vitamin K. These vitamins function as co-factors to aid the metabolism of carbohydrates, proteins and fats. From the leaves of raspberries can be prepared teas that are used to relieve inflammation of the throat, relieve inflammation of the intestines, against diarrhea, skin diseases, strengthen the heart and raise the immunity. This tea helps with painful menstruation and with menopause discomforts. Also raspberry tea is recommended to purify the blood and against cough. Given the rich antioxidant and anti-inflammatory phytonutrient mixture found in raspberries, it’s not surprising to see studies showing raspberry benefits in cancer prevention. Chronic excessive oxidative stress and chronic excessive inflammation can combine to trigger the development of cancer cells in a variety of human tissue. By providing a rich supply of antioxidants, raspberries can help lower risk of oxidative stress, and providing a rich supply of anti-inflammatory nutrients, raspberries can help lower the risk of excessive inflammation. When combined, these results mean decreased risk of cancer formation. In animal studies to date, the cancer types most closely examined in relationship to raspberry intake are cancers of the breast, cervix, colon, esophagus, and prostate.